ISLAMABAD: China reassured that there will be equal socio–economic benefits to all parts of Pakistan, under China-Pakistan Economic Corridor (CPEC). According to President, China-Pakistan Friendship Association Sha Zhu Kang, China and Pakistan are working closely to ensure benefits of CPEC across the board. He told Chief Minister, Khyber-Pakhtunkhwa (KP) Pervez Khattak during his meeting with him in Beijing that his country would extend all out support to his province as well for its rapid development. The Chinese companies will continue to work in KP and providing job opportunities to a large number of locals. The chief minister had led a 160 member delegation to Beijing to hold roadshow to invite Chinese investors for investment in KP projects under and outside CPEC. According to Provincial Minister and spokesman of the KP’s government Mushtaq Ghani, the delegation received a big support form the Chinese side. Terming the visit as highly productive, he said it will have far-reaching impact on the development of the province under CPEC. The road-show was a big event, and contributed a lot to strengthening their cooperative partnership in various areas of bilateral interest. The Chief Minister, he said strongly pleaded the cause of the province and succeeded to bring heavy investment for his province. Zhu Kang said, the success of One Belt and Road Initiative is linked with the CPEC as it is pilot project of the initiative. This project will not only benefit both China and Pakistan but it is beneficial for regional and global economic growth and all the countries and economies along the One Belt One Road Initiative will benefit from it, he added. 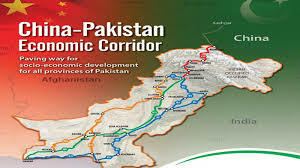 He said the proposed corridor stretching from Kashgar to Gwadar will bring about economic and social progress for not a particular area but the entire Pakistan. During the two-days road in China, CM KP highlighted big investment opportunities offered to Chinese public and private sector entrepreneurs in different sectors including energy, railway track, roads, industrial park, cement factories, tourism and agriculture which would be part the CPEC. The chief minister elaborating the agenda of roadshow to media said he was looking forward to sign agreements with Chinese companies for development of energy and transport infrastructure projects in the province. “The Chinese companies would be offered to invest in these projects including 1200 MW hydel power generation project, running of fast train to link Peshawar with Charsadda, Mardan, Swabi and Nowshera and construction of a road to connect Chakdara with Gilgit via Chitral,” he told newsmen. At the end of road show, KP government signed 11 Memorandum of Understanding (MOUs) with the Chinese Companies for completion of various development projects under China-Pakistan Economic Corridor (CPEC) framework in the province. Speaking on the occasion, Parvez Khattak invited the Chinese companies and businessmen to take advantage of investment-friendly atmosphere in the province for mutual benefits of the people of two countries. “We have set the stage to begin journey of industrialization in the province and we need support of our “iron brothers” to put the province on the path of development and economic growth,” Parvez Khattak said while inviting Chinese companies and businessmen to take advantage of investment-friendly atmosphere in the KP..